The purpose of a project plan is to translate goals into objectives and results. Yet getting there requires adherence to a disciplined process. There are four phases of the standard project management process. This same process is used for everything from developing space exploration projects to building bridges. If you perform these four phases correctly, you should be able to achieve the desired results that were goals for your project. 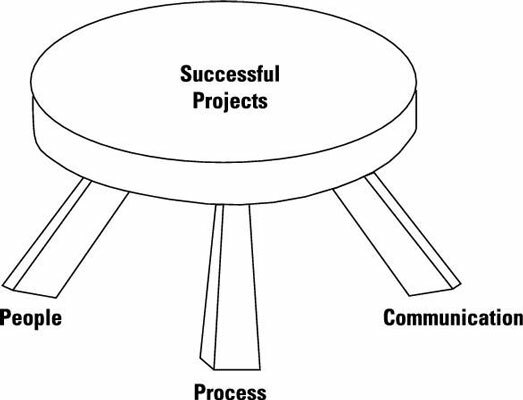 Most project managers use the terms scope change and scope creep almost interchangeably. Scope change includes large, deliberate decisions about the extent of the project. Scope creep, however, indicates less conscious decision-making on the part of the project management team and the client. Successfully suppressing scope creep is one of the keys to achieving your cost and timing goals. Be aware that scope growth is a strategy for some companies. Some companies will lowball the cost to win the business and then rely on customer scope changes to recoup the under bid. The classic example of scope change happens around the building of a custom home. The contractor is happy to accommodate that change from composite to natural granite countertops, at a substantial extra fee! Your ability to make changes in your project decreases as you move through the process. 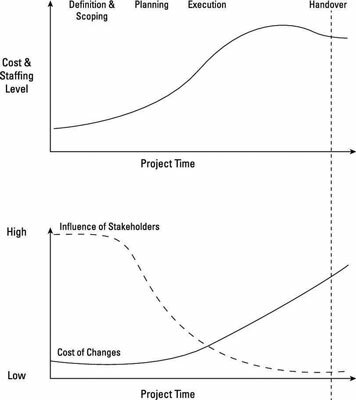 As you move from definition and scoping to handover, the cost of your project progressively increases. Moreover, the dependence of your future work on past decisions increases as well. This makes the cost of changes more expensive as you progress through the project life cycle, particularly for decisions that you’ve already spent money on. For the same reasons, the ability of management and stakeholders to make changes to the project decreases. Changes that you can make with a simple line on a piece of paper in the definition and scoping phase can literally cost millions of dollars in the execution phase. Getting it right early in the process is crucial. Go/no-go decisions occur between the defining/scoping, planning, and execution phases. In other words, after you complete the definition and scoping phase, you may decide that the project isn’t likely to achieve its goals, which leads you to abandon the project. Companies often refer to these go/no-go decisions as stage-gates or phase-gates. Almost all companies use them. Pulling the plug on a project may be a very good idea in some cases because you don’t want to throw good money after bad. Energy companies are known to spend up to $3 billion on a $10 billion project in the planning phase and then cancel the entire project. And this is okay! It’s much better to cancel a project after spending $3 billion than losing an additional $5 billion when your planning phase determines there isn’t enough oil in the ground to make the project profitable. Some companies have even expanded this idea to create competition in their planning process. For example, many electronic firms start 50 projects in the definition/scoping process each year, fully expecting to winnow that number down to 10 projects after the first stage-gate. After the planning phase, they expect to narrow that number down to 5 projects that they’ll actually execute. This Darwinian-style competition is sometimes called the project funnel. It promotes alignment with the client and team members. It prevents rookie mistakes that occur because a project manager forgets to do something important in the process. It helps keep scope creep at bay by documenting exactly what is (or what isn’t) in the scope of the project. One polite way to suppress scope creep from your client is to refer back to documentation showing that the new whiz-bang feature that your client now wants is indeed scope creep and can’t be completed on schedule or within budget.